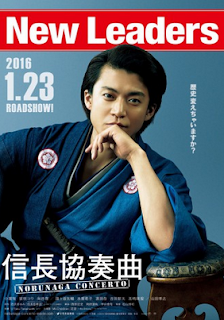 "Nobunaga Concerto" will be released as a movie next year, more specifically on January 23rd. Originally a manga series by Ayumi Ishii, the story was recreated as a drama series with Shun Oguri in the lead. For the movie, Oguri will reprise his roles as Saburo & Mitsuhide Akechi. The filming began in early April of this year, and continued for about two months. It features a major battle scene, with around 300 extras. Real temples and shrines, such as the Kamo Shrine (Kyoto) and the Hikone Castle (Shiga), were used in the movie. "There were many difficult times when working on the movie for over six months. Despite that, I am glad to be able to live Nobunaga Oda's life until the very end," Oguri stated. "This time, there are many battle scenes where both Saburo and the Oda family fight together. There's many things to look forward to, especially how Saburo and the real Mitsuhide ends up."